Selecting an expedient business telephone system that can accommodate all your communication needs may be daunting task for you. With new advances in communication, it is time for your business to upgrade your existing telephone system and utilise new digital technology. B2BCOMZ can assist you with selecting, setting up, installing and configuration of various telecommunication systems. Our vast varied product line and enormous range of services can fit any office environment. At B2BCOMZ, we clearly understand that a well-structured communication system is an absolute necessity of any business organization. Moving with new technology trends, we can offer you the latest and yet affordable range of business telephone systems for improving communication and interaction of your business firm. 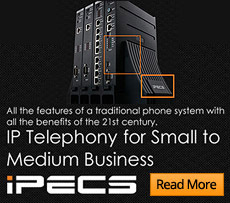 Our range of ipecs phone systems is easy to configure and install. Available with different user-friendly features, it can revolutionise the way you do business. Our team of skilled professionals at B2BCOMZ can deliver tailor-made solutions as per your requirements and use. Everyday use business Ipecs lip-8012d systems from B2BCOMZ can render remarkable advantages. Investing in lip-8012d can prove beneficial for your business. Features such as soft key, one button operations and navigation make it easy to use. Voip technology integrated in this telephone system can provide applications such as mobility, conferencing, multimedia, networking and more. Feature rich business phone systems from B2BCOMZ can boost your staff productivity and overall business performance. We can provide you with the most forceful communication systems needed for your business that is flexible to change and handle more traffic in near future.